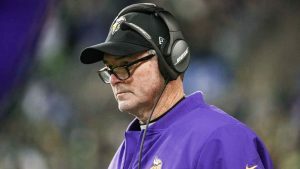 Vikings coach Mike Zimmer said he plans to become more involved with Minnesota’s offense after firing offensive coordinator John DeFilippo after 13 games on Tuesday. Quarterbacks coach Kevin Stefanski will take over offensive coordinator duties on an interim basis during the Vikings’ remaining games this season. Stefanski, whom the Vikings blocked from interviewing to be the offensive coordinator for the New York Giants last offseason, has been with the franchise since 2006. Stefanski’s level of familiarity with the team, having coached quarterbacks, running backs and tight ends in Minnesota, provided the benefit of familiarity as he embarks on calling plays for the first time in his professional career. The Vikings (6-6-1) are on the cusp of the postseason, slotted as the sixth seed in the NFC playoff picture with three games remaining. The sense of urgency that comes with these final games as Minnesota aims to solidify its playoff positioning made Zimmer want to “shake things up” among his staff and while the offense pivots in a different direction. Stefanski will be able to use his experience over the next three games to essentially audition to remove the interim tag from his title after this season. Zimmer would not say whether the team has plans to conduct a search for its next offensive coordinator regardless.